Old people and cruise ships go together like... hell, like old people and shuffleboard. Why do you think they go on cruises? But one octogenarian made her vacation permanent by selling all her stuff and living on a cruise liner -- for seven years. 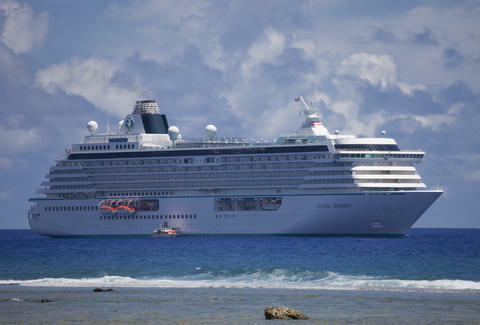 Lee Wachtstetter, 86, sold her five-bedroom home in Fort Lauderdale, FL seven years ago to become a resident aboard the Crystal Serenity, in a single-occupancy room on the seventh deck of the 1,070-passenger ship. "The day before my husband died of cancer in 1997, he told me, 'Don't stop cruising,’” Wachtstetter told app.com. Well, she took the advice quite literally and now, she's living the dream. Although all that ballroom dancing, cocktail partying, and shuffle-boarding costs her a pretty penny -- an estimated $164,000 a year. To date, Wachtstetter -- who went on 89 cruises with her husband before his death -- has been on around 200 cruises, and visited more than 100 countries. "I stopped counting after 100," she said, which sounds very much like something someone who's 86 would say. "Just say I've been to almost any country that has a port." These days she doesn't bother getting off the ship much, except to see her family the five times a year the ship docks in Miami. Prior to living aboard the Serenity, Wachtstetter actually lived on another liner for three years, meaning she's spent 10 years on a cruise ship... and it was by choice, not by punishment! That’s a decade of buffets and Michael Bublé-type crooners. It's amazing she's lived this long. But, hey, more power to her. She has indeed not stopped cruising. Chloe Pantazi is an editorial assistant on Thrillist's travel team. She couldn't cruise the seven seas for seven days let alone seven years. Follow her on Twitter at @ChloePantazi.